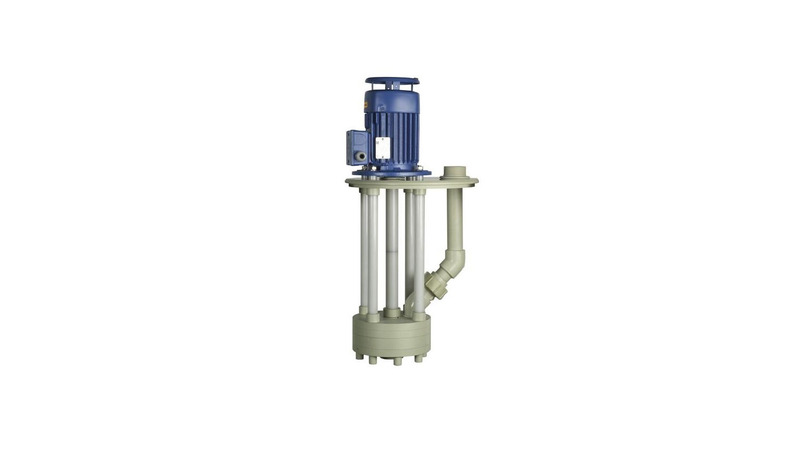 In this type of centrifugal pump, the pumphousing is separated from the motor by support pillars. The impellor is driven by an extended shaft. The pump is mounted in that way, that while the pump housing is immersed in the liquid, the motor is situated above. In this design the shaft seal or bearing, the most sensitiv wearing part of a pump, is eliminated. Bohncke immersion pumps differ from all other products. The feature that makes these pumps superior to all other immersion pumps is the extremely stable construction achieved by means of robust plastie covered stainless support pillars. Therefore it is impossible for the pump to distort. This would inavitably lead to a distruction. This construction even allows that our iihmersion pumps in PP (Polypropylen) can durably run at temperatures up to 90&apos;C. All pumps are manufactured from PP (Polypropylen), PVDF (Polyvinylidenfluorid) and on special request also in PVC (Polyvinylchlorid). This special design and thightly controlled production method removes the danger of damage or pump failure coused by torsional movement and dimensional instability. This would also cause darnage. The unique construction also stabilises the drive shaft and makes any guide or bearing within the pump housing unnecessary. Consequently the Bohncke immersion pumps ean be run dry and have no wearing parts other than the motor bearings. Bohncke immersion pumps are principaly suited for all low viscosity liquids commonly found in the plating and chemical industries. They are the only truly reliable pumps for use in electroless copper, and -nickel baths as well as for certain palladium and precious metal plating solutions. In use with electroless solutions the metal reduced inside of the pump will not harm as long as it does not grind. Therefore the pump must than be stripped in time.